I do love a good quick fix. As a lazy girl at heart, anything that gets the job done quickly is a winner in my eyes. This can be anything from skin pick me ups, to speedy makeup routines and even teeth whitening to make sure my whites are pearly. So, I thought I’d run through the products that I use to give my skin a quick boost, mostly if it’s looking dull, dehydrated or congested. Cleansers | People seem to rely more on treatments to target skin issues and the humble cleanser often gets pushed to one side. I, personally, think cleansers can make a world of difference to the skin. Opting for a more balmy, soothing texture the Oskia Renaissance Cleansing Gel is a new purchase but one firmly in the ‘love category’. It smells divine, you don’t need much of it and the consistency is just wonderful to make it feel like it’s more of a skin treat. It removes makeup like a dream too, leaving skin soft and plump, definitely one of my favourites! Toners | These tend to be split into two categories: hydrating and exfoliating. I’m yet to find the perfect hydrating one, but the First Aid Beauty Facial Radiance Pads are a great pick me up for dull skin. Although I wouldn’t use one twice a day as you would a normal toner, using them three times a week or so had made such a difference to the overall radiance of my skin. Definitely a one to think about for Autumn, when you tend to up the exfoliation due to rubbish weather leaving skin less than perfect. Moisturisers | Finding a moisturiser that makes a visible difference is often a hard one, as other products appear to do much more for the skin. But, if mine is looking a little lackluster or dehydrated, Zelens Z Matrix helps restore the balance. It’s a light, gel-like texture which packs a good hydrating punch without overloading the skin. I do really adore this one and, although pricey, would consider a repurchase! 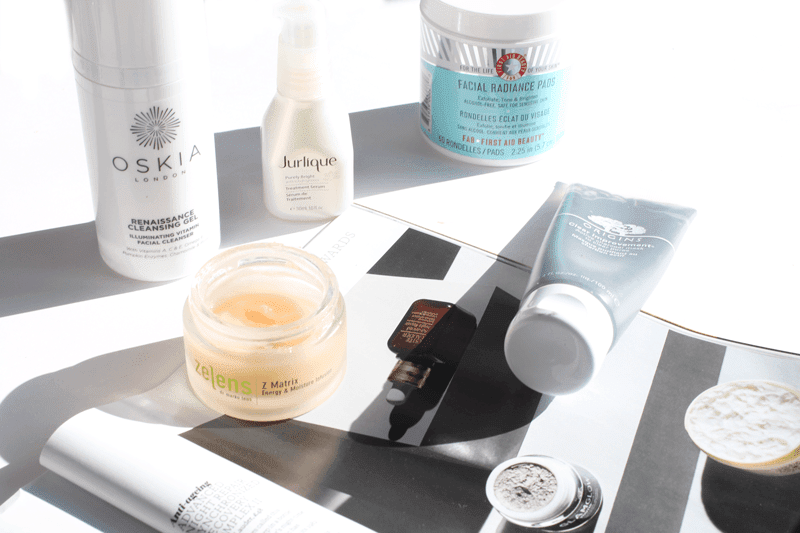 Treatments | I’ve added two in here, because I adore both masks and serums for sorting out my skin. If it’s congested, I’ll steam my face (my new addiction) and apply a thin layer of Origins Clear Improvement Active Charcoal Mask to really help clean deep down, getting rid of any grime. If I’m after a serum which works overnight to give my skin a boost, I’ll go for the Jurlique Purely Bright Radiance Serum. I love the botanical scent of this and it really calms my skin, while giving it a dose of radiance as I sleep. The perfect fix! What skincare do you rely on when your skin isn’t looking its best? Let me know! Don’t forget to check out my blog sale and enter my £300 rayban and beauty goodies giveaway – it ends on Sunday!